Weekend Recap: 5K PR + New Youtube Channel! Hello to all of my beautiful followers! I hope you all had a wonderful Holiday weekend and are recovering from binge eating pumpkin pie and turkey! This past week has for sure been super eventful for me – visiting friends & family, running, shopping and spending WAY too much money, and of course, being lazy. A lot of exciting things have been going on + are coming up in the pipeline, and I wanted to share it with all of you! First off: I ran my fastest 5k since my knee surgery! I remember 1 year ago, I ran my first race post-surgery – a 4-miler – with an 8:40 pace (I think I was so embarrassed of my time that I never blogged about it). I know that time is nothing to be ashamed about, but compared to my sub-8 minute pace pre-surgery, I was pretty upset with it. Anyways – fast-forward 1 year later, and I ran a 7:38 pace 5K! Anyways – my next goal is to beat my official pre-surgery PR – 7:22 pace. However, it will have to wait, because running in the cold is my least favorite thing in the world to do! 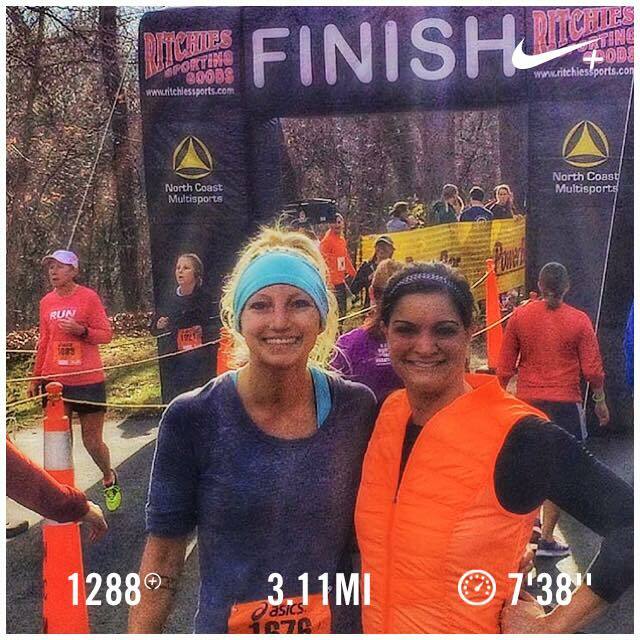 I ran the race with one of my good friends from high school – she set her own PR as well! After a night of drinking with friends, I would say this was a nice way to start the holiday! 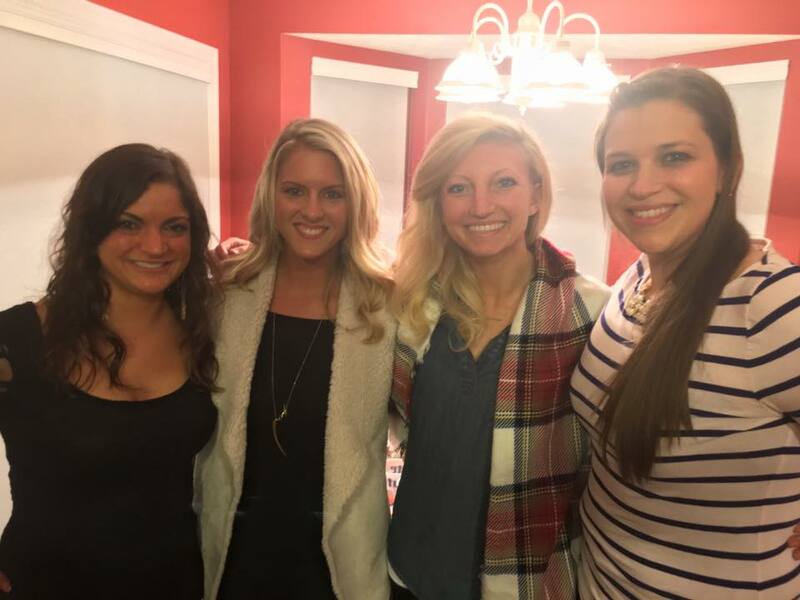 catching up with high school friends! Next up: Shopping! No woman ever passes a good sale up – 5 scarves, 3 pairs of shoes, clothes, an ipad, and a gopro… My bank account was basically sending me hate mail by the end of the weekend! However, I am most excited about my go pro… After all the adventuring I have been up to this past year, I thought it was necessary to have a cool camera to capture everything. Also – Youtube. Yep! A few friends of mine suggested that I start a yoga youtube channel, posting quick 15-20 minute videos, handstand tips, etc. I never, EVER considered doing this, because I absolutely hate seeing myself on camera. Totally dumb, right? However, I do need to take my own advice sometimes ALL the time…. so, I must go do things that scare me the most, no matter how hard or uncomfortable it might seem at the moment. I mean, if I can become a certified yoga teacher even though I am terrified of public speaking, travel to a bunch of new countries by myself for the first time, AND go bungee jumping even though I am petrified by heights… I think I can create a video and post it to the internet (even though millions of people can view it)! So with all of that being said, I created my first-ever yoga video – a short clip on how to do a Sun Salutation A – to test the waters a bit. Feeling a bit awkward, not saying everything I think I need to say, and saying UM a lot – I posted my first video here. Check it out and let me know what you think! I am definitely my own worst critic, but we all gotta start somewhere I guess! I will be creating more videos when I can find some free time – so if there is anything in particular you would like to see, let me know! It’s a little weird to record myself for long periods of time, but I am having a little fun with it! Also – any tips on how to use, good editing apps/software is appreciated! I feel like such a newb and have no idea what I am doing half the time! I have an upcoming handstand workshop in December! Teaching at Melt Hot Fitness in Westerville, the class is $30 and limited to the first 20 people who sign up. I will post more details soon! Traveling to NYC in a few weeks to take a yoga workshop + visit friends + explore the city. Any place I absolutely need to see while I am there? Thanks for staying and reading my long recap! So many exciting things going on, and I love that I can share with all of you!